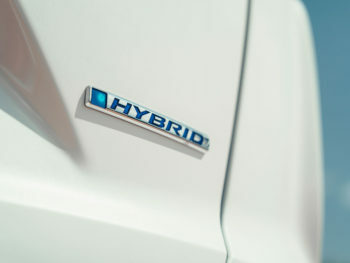 Latest figures from Cazana, which track the used car pricing performance by fuel type across the last 12 months at the key ex PCP age of 2 years/24k miles, show that hybrid values as a percentage of cost new have risen from 65% in March 2018 to 68% in March 2019. Meanwhile values for fully electric cars have risen from 54% to 56% over the same period – which Cazana says is attributable to the greater volume of cars coming to the used market with more usable driving ranges. The rise in values has happened despite last October’s changes to the Plug-in Car Grant that saw the grant for PHEVs axed as part of a reformed system focused on increasing uptake of electric and hydrogen fuel cell vehicles while the grant for EVs was reduced from £4,500 to £3,500. The Cazana data follows comments from Shoreham Vehicle Auctions two months ago that used demand for electric cars and vans is swiftly accelerating, resulting in stronger residual values. 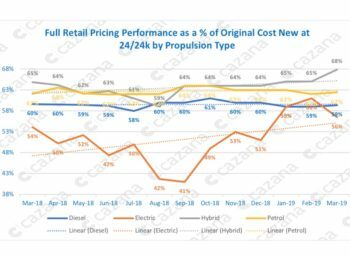 Cazana’s data also shows that these are the only two fuel types to demonstrate a clear upward move in retail pricing terms in a market age profile that is currently experiencing a marked increase in volume. It is also significant to note that diesel pricing remains strong in the used car market, having fallen by just one percentage point year on year, despite the issues in the new car sector, whilst petrol has remained steady. 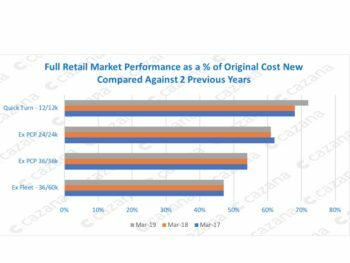 Cazana’s data also shows that despite anecdotal evidence of difficulties in the used car market, values – including for fleet – generally remained steady apart from for the 24-month-old ex PCP sector.